Get ahead of the game by letting the information come to you. 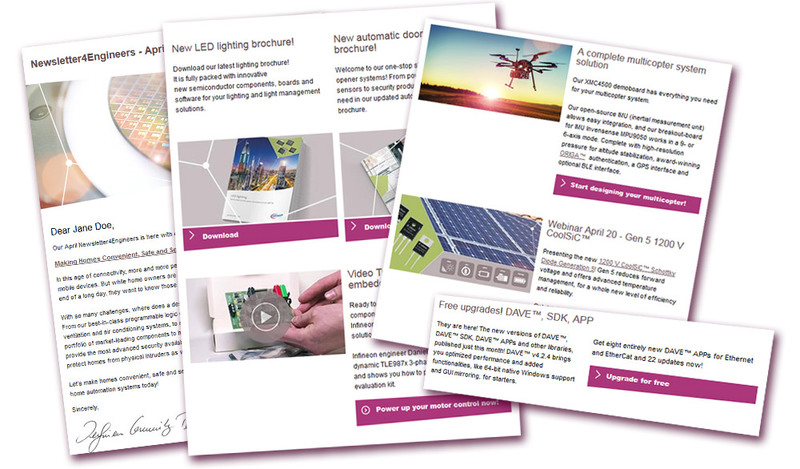 Infineon Technologies offers a wide range of semiconductor solutions, microcontrollers, LED drivers, sensors and Automotive & Power Management ICs. Newsletter4Engineers gives you what you need. In order to give you the exact information that you need we kindly ask you to complete the form below. We deliver the news you want, with exclusive event invitations, tutorials, cutting-edge applications, tools, and products - handpicked for your industry and location. Every month. Join over 200,000+ fellow engineers who get our newsletter via email. Sign up today! Be smarter. Be up to date. Be THE first to know.